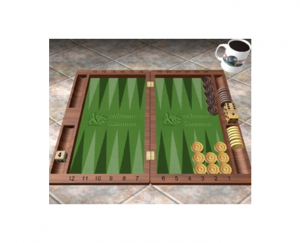 This was what I was dreaming of when I created the Patio Series – a balmy but not unbearable afternoon, a shady patio, some good beers, and some enjoyable backgammon. APEX was a decent spot for the meetup, but probably not one we’ll go to again – the only beverage choices are beers and ciders, and no food choices, and modestly strict about outside beverages given they don’t offer coffee even. So it didn’t work for everyone for refreshments. On the other hand, we weren’t hassled at all. Having learned from the fiasco at Prost!, I did bring spare boards this time. We didn’t need them – Julie, Martin, Kris and Tim all brought boards, so we were set. We had 6 people initially, and so settled into 3 pairs. Jarom showed up about 15 minutes late, but we were able to deal him in no problem. My first match was against Martin, and it was one of those one game matches. Martin doubled me early, I had a chance to redouble later, and then pulled off a gammon. I wasn’t nearly so lucky the next round. Jarom and I went back and forth – he took the first game or two, I rallied to 4, he survived the Crawford game, and then pulled off the remaining games necessary to take the match. I ended up by playing Julie, who proceeded to not only win, but to frankly slaughter me. It was fun! Martin had a chess buddy who was hanging around, and made a poorly advised bet, that if Martin beat Kris that the group would have to buy him a drink but if Kris won, he’d buy everyone a drink. Naturally, he left before the match was over. But Martin knows a free drink when he hears one – I’m not saying he threw the match, but that was one we were all rooting for Kris. After that, Martin threw in the towel, so he only got two matches out of the day. Somehow, we ended up with everyone else getting 3 games, though I might have had 4. It’s a little fuzzy now. Tim took first place, Jarom took second, and I took off while Julie and Kris finished their third matches. In spite of my fairly last minute announcement of the meetup, we had a pretty good turnout – 10 players total! Last time we went to Occidental, I got griped at by management for having so many people show up without advance warning. This time I got off with a “it would have helped if you called ahead”, to which I could honestly say “I did!” Of course, I ignored the request from when I called ahead to email someone else and I can’t find that piece of paper anymore, but anyway. Any of you old timers remember Charlie, he’s back – he crushed me in the first round 7-0, and went on to take second in the tournament. Jarom is turning into the man to beat – he took first this time after coming in second last month. It was a good mix of some of the regulars and a few faces we haven’t seen in a while, or ever. Swiss format is still striking me as a great approach – everyone got at least 3 matches and some people got 4, and we were pretty much out of there by 4:30. See you in a few weeks at the next Patio Series! Here I’m black, and just rolled a 4-2. There were two options I was considering. First, 7/1*; second 8/6, 7/3. According to both GnuBG and XG, these are the right two options to consider, but it’s not especially close. It took me a minute or two over the board, though. 7/1* has about 39.4% wins, about 8% gammons; the more passive but safer looking 8/6, 7/3 is a blunder (-0.092 according to GnuBG, -0.137 according to XG). As usual, it doesn’t look that big of a difference to me. 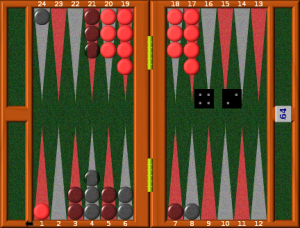 But I guess the difference comes not with red’s next roll, but black’s roll after that. With 4 men back, I’m in trouble on the next roll if red re-enters, or hits. As it happened, Tim danced, and I was able to pull this one off. After Tim, I had a final match with Lee, who is moving back to Vegas this month. He’s been a fun addition to the group, but says he’ll be back for visits from time to time, and of course we can look for him when in Vegas (although we won’t be able to talk about it…) I gave him one of my bar boards as a parting gift. I then made the tactical mistake of agreeing to play Martin on his own board, and got crushed. I wish I had taken a picture of the position that cost me most of the match – I had a choice of hitting loose on my home board (leaving two blots) or covering a blot on Martin’s home board, and went with the chicken move, which was probably wrong by a lot. By a bit before 4, Jarom and Martin were the only two undefeated players, and so they played for the championship. 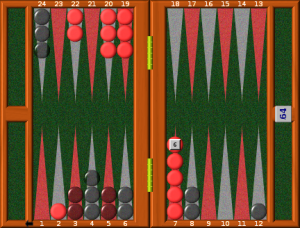 It was a good match, and Martin got the top spot for today, winning the final game with some very timely double 4’s. I’ll be posting a summer schedule soon – my thought is to do a “tour of patios” series, hitting two or three places we can play in the sun over the summer. Stay tuned for that! The final accounting is in. I shouldn’t have bought the candy. We had 32 attendees. Why 31 hospitality fees? “Things happen.” I had one registrant who didn’t pay this fee, and I didn’t realize until slightly later, and I let it go rather than further agitate him. The “Tip” I will call out publically: thank you, Kevin, it was a classy gesture. Originally the hotel was going to charge me for 4 gallons of coffee on Sunday, but I protested there was no way the size of a group we had left at that point could really have gone through that much, and they relented and dropped it to their minimum 2. I will say the Sheraton was super easy to work with, start to finish, and I agree with the people who did my post-event survey that it was an excellent venue, even if parking Saturday night got a little tight. I had several people suggest I move it to downtown for the next event, but I am not sure I will be able to swing the increase in rent that would entail. Any other tournament directors who happen to read this are going to be shocked and amazed that the hotel fee was so low, and again, most of that was consumables: coffee, at $59/gallon + 23% gratuity. Many people expressed their appreciation for it being there, but my goodness! And don’t get me started about the whiteboard fee! I also have three books for door prizes which didn’t get handed out. I might see if anyone wants to buy them off me, or return them, instead of saving them to next time, and recoup the loss that way. 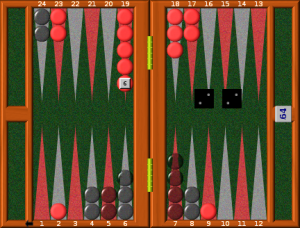 I just philosophically am bothered that, in effect, I spent $43.30 to watch other people play backgammon. The whole reason for running the club is it gives me a lot more opportunity to play – organizing this event gave me a lot of opportunity to do a lot of other things besides playing. But, it’s good for the community, and it kept me out of other trouble for a good stretch, so no problems. Running this group is a constant emotional rollercoaster, let me tell you. I normally send a reminder email, but I didn’t this month. Then I got sad as I saw our numbers drop from 9 people RSVP’d to 4 as the weekend approached and some people realized there would also be a football game on TV at the same time. Then, as I drove over to Lucky Lab, three last minute RSVP’s hit my phone. Then, a couple of people who hadn’t RSVP’d at all were there waiting. So we had 9 players after all! You probably know that 9 isn’t a power of 2, and so doesn’t fit easily into a bracket, but we made due with one first round bye and one second round bye. First round, I took down Kevin in a ruthless series of 3 games. Kevin went on to win the consolation bracket, so don’t feel too bad for him. Newcomer Jake drew Martin, and showed himself to be no slacker, taking that match. Bryan faced off with but couldn’t defeat Tim. And Nathan and Lee got their money’s worth out of the match, playing an extended series of back games that meant that the timing of the whole bracket was at risk. Sharon, in the meantime, drew the first round bye, and had to just sit around waiting. But don’t feel too bad for her either, because she went on to win the main flight, taking out Tim in a high spirited match. I didn’t take any pictures this time, so no positions to analyze – sorry. But the day was a success – we played up until around 5, lots of pick-up games after the tournament, and I was still home in time for dinner. I think everyone took a flier for the Portlandia Backgammon Classic (see http://pdxbg.club/2018-portlandia-open/ for details and registration form!) and there was a lot of excitement about that upcoming event. Join us at Lucky Lab again next month for another tournament, last one before the big game! We had a decent showing this afternoon – 9 players! Slightly too many for an 8 person bracket, but we made do. I have been reading some on bracket design, and shuffled it so that we didn’t need to have effectively 7 byes on a 16 person bracket… not sure it went perfectly smoothly, but it worked. At that point, I was playing Scott for the first/second in the main flight, and Lee and Tim were facing off for the consolation. I figured they would be fine, being as it was only a three point match. But a five point match in 50 minutes is… a little tight. Totally doable, but a little tight. As it turned out, we finished the first game in about 12 minutes. In the second, Scott offered me an early-ish cube, which I was able to return to him just after we broke contact. I don’t recall the exact pip count for each of us, but Scott, I think that was a drop. But hey – second place for your first visit is pretty good! Lee held on to take the consolation bracket, and we all scattered at a few minutes before 5. Well, Julie and Martin were still finishing up a “just for fun” game. Normally, I conclude these posts with some statistics about each player’s Elo score etc., but this is the last tournament of the year and so instead I have some statistics about the whole year. In 2017, we had 10 official tournaments – 11 if you count September when only Martin showed up. In that time, we had 49 people attend, and played a total of 354 matches! Gold stars for attendance go to Bryan, Julie, and Martin. Special platinum stars for attendance go to Kevin and Sharon, who only made 5 tournaments each, but drove up from Coos Bay for those 5, so they clocked more miles than anyone else. Our winning-est players are: Mark F, who won 11 of the 14 matches he played in 2017; and Lee, the new guy in town who has won 7 of his 8 matches so far. I can’t wait to watch the two of them go head-to-head next year! Which will probably happen at the big Portlandia Backgammon Classic, this coming March 24-25, 2018. Register today! Or tomorrow. No rush.